I actually haven’t taken many “treasures” from my parents’ house, probably because there wouldn’t be room for any of it in my apartment due to my own collection of treasures I’ve accumulated over the years. If this week hadn’t been so busy though, I would’ve gone over to my parents’ to take pictures of the soda can lamps and giant shoe shine box. Oh, and the “gym” on the side of the house made out of a pulley system and 2-liter plastic bottles filled with cement is something I’ll try and capture for you, too, because it’s just so awesome. 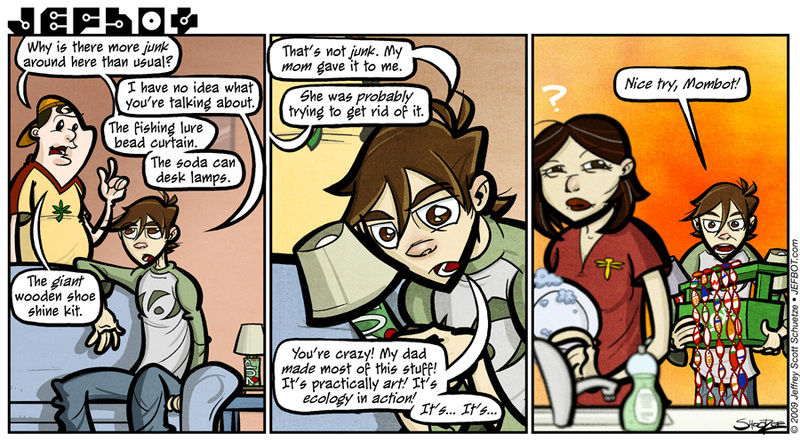 Always a very true statement: “One mans junk, is another mans treasure.” This was a cute strip, and I look forward to seeing the collection of treasure as time goes on! I love the quizzical question mark over Mombots head as JB is bringing everything back over. In fact I like that whole last panel, the colors and the scene itself. The pop can lamps are so cute! I just wanna hug ’em! Fishing lures for curtains? That has to be interesting, and quite honestly if I found the right lures I would love to attempt to make something like that myself. 😀 Looking forward to your sharing all of these little treasures with us readers! i’ll definitely be sharing more of my dad’s “treasures” in future strips, Spanky, but probably not ’til next year sometime (although i might just have one more in me before i end this little run). yeah, those little soda can lamps are pretty awesome – especially cuz they were made years and years ago, so the cans are kinda retro now. thinking back on them, i’d really like to take at least one for my hoard. Are you giving ALL your characters their personal logo? Or is it just the shirt? I have similar workout equipment, courtesy of my dad – a broom stick with a rope hanging down which is tied to a coffee can full of cement. The point is to twist the broom stick until the rope is all the way up and then all the way down. – No telling what that lamp could have brought ya on ebay. and i think my dad must’ve decided to up his workout a bit with those 2-liter bottles, cuz i seem to remember him having those cement coffee cans at one point, too. Hilarious! My dad was trying to pull crap like that on us. Before we actually decided to try having a baby, he was trying to unload a bunch of baby stuff (from when my sister and I were kids!) on us. At first I read “that shed will be EXPLODED” in future strips. …how do you think I’ve furnished my entire home? With my mom and dad’s unwanted “treasures”!!! So funny and all too true! I love the last frame, the focus is so cool! Great job Jefbot! And one more is on the way! The Musashi I made will hopefully be arriving in the mail today. Woot! I know firsthand the hoard of JEFBOT – and all I can say is ~ ONCE A COLLECTOR . . . ALWAYS A COLLECTOR!!! Mombot is a clever woman, a clever woman indeed. *offers the secret clever woman’s handshake* Look away BOT, this’ll melt your face Raiders of the Lost Ark style. Mombot is a clever woman indeed, Foxmouse. as to whether she was intentionally dumping that stuff on jefbot or whether it’s just all in his mind, i’ll leave it for you to decide. ah my back. wow. this is awesome. seriously. i discovered jeffbot 2day at 3pm or so. i don’t have net so i jus came to the nearby cafe y’know- 4 1/2 an hr or so i hoped..check some mail, webcomics (i came here through calamities of nature)……n how its 8:30. i’ve finished the archieves (da servers here are a bit slow), my mom is going to kill me and i owe a ton of money to da cafe lady. ….but it was worth it. jefbot RRRRRRRUUUUULLLLLEEEESSSSSSSSSS!!!! hope to hear from you again in future strips! Love Mombot’s confused expression XD So funny trying to figure out what her “crazy” child is complaining about this time. @_o why in the world did Dadbot created a GIANT shoe shine box?!!! I would like to know about that one. as far as the “gym” goes – i was going to take a picture of it yesterday but it’s attached to the outside of my parents’ house and it was dark by the time i got there. i’ll try and remember next time, though! And you still haven’t say why Popbot created the giant shoe shine box?!!!! XD just wonderful. I really love those things that one does with the trash, i mean, just think of the possibilities! true dat, nicodemus. you should ask my sister, Laura (aka Lor), about some of the art projects she made from trash, years ago.